There is a time for everything; a time to buy a solid state drive in lieu of the conventional hard disk drives. There’s no pun intended, hard drives make a great storage option, but in terms of speed and data security, SSDs are the way to go. The best SSDs aren’t hard to find, the fact that lots of different SSDs abound in the market today notwithstanding. For the next few minutes, this best portable external SSDs review article will tell you more about the best SSDs you should go for if you are about to start shopping for external SSDs for your Windows or Mac computers. We’ll highlight their features as well as their pros and cons. Have a look at the table below which shows the SSDs we are reviewing. How do you say fast in your language? That’s how to describe the speed of the Samsung T3 Portable SSD. This portable SSD weighs just about 1.8 ounces; simply put, it’s lighter than the word lightweight. It measures 2.9 x 2.3 x 0.4 inches and fits into an average sized pocket on any adult trousers. That’s not to say you should always have it in your pocket. Like most other SSDs, the Samsung T3 Portable SSD provides ultra-fast data transfer speeds, thanks to its USB 3.1 support. The USB 3.1 is also downward compatible with USB 3.0 and USB 2.0, thus making it compatible with as many devices as possible. The Samsung T3 SSD is aesthetically appealing. 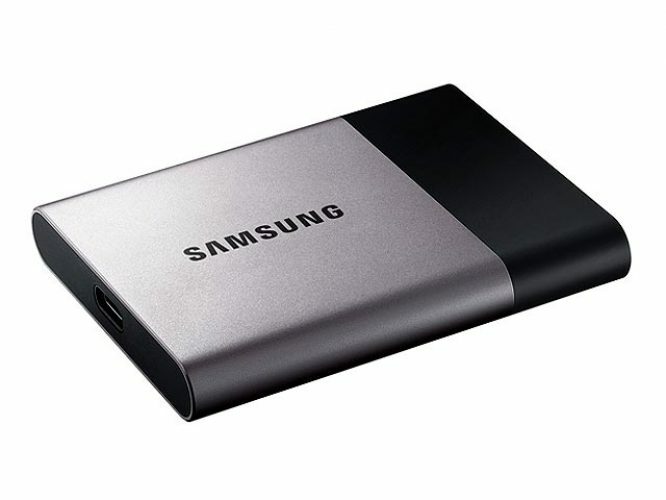 First, unlike its predecessor the Samsung Portable T1 SSD (which has been discontinued) that uses a plastic casing, the T3 is enclosed in a super strong aluminum casing. According to Samsung, the T3 can withstand falls from heights of 6.6 feet and a force equal to 1500g’s. I cannot tell if Samsung is just trying to market their product with those numbers. However, I do know that the casing looks sturdy and rigid enough to hold some slight beating. I tossed mine to the ground stylishly from a height of about 3 meters and it still works fine. The Samsung T3 Portable SSD is available in various storage capacities: 250GB, 500GB, 1TB, and 2TB. It boasts of fast transfer speeds of up to 450MB/s as advertised, however, its transfer speed hovers around 350MB/s. The Samsung T3 SSD protects your data by using state of the art AES 256-bit encryption, and lest I forget, it is also worthy to note that the SSD on the T3 uses Samsung’s 48-layer V-NAND technology. The drive is Windows and Mac compatible. Its rugged design makes it able to withstand some amount of pressure. The price is the only downside of this great SSD. Conclusion: If you want a rugged SSD with unrivaled transfer speeds, lightweight and fits into your pocket easily, then the Samsung T3 Portable SSD is what you need. The SanDisk Extreme 500 portable SSD is yet another SSD that captures the heart of any SSD lovers. It sports a distinctive diagonal shape which is quite unlike anything we’ve seen before. The design speaks of the rugged nature of the drive which is splash water and dust resistant and is covered by a kind of rubber. The flat nature of the design makes it look extremely portable, and yes, it’s portable. The SanDisk Extreme 500 SSD weighs just 2.7 ounces and measures 3 x 3 x 0.4 inches. Quite unlike what most people expected, the Extreme 500 is powered by a USB 3.0 port which sits closely at one edge of the diagonal body and a key holder hole sits at the other edge. Just like the Samsung T3 Portable SSD, the SanDisk Extreme 500 Portable SSD is available in a plethora of storage units: 120GB, 240GB, 250GB, 480GB, 500GB, and 1TB. It is formatted out of the box in exFAT format so you can easily transfer your files from and to a Windows and Mac computers with ease. That’s not all, as the SanDisk Extreme 500 protects your data with its 128-bit AES encryption technology which is below what is obtainable on the Samsung T3 SSD. However, you can pay extra to get 1024-bits encryption. I did find the cable that shipped with the SanDisk drive short; it’s about 9 inches long. Out of the box, you are entitled to SanDisk’s Secure Access 3.0 software on both the Windows and Mac operating systems. 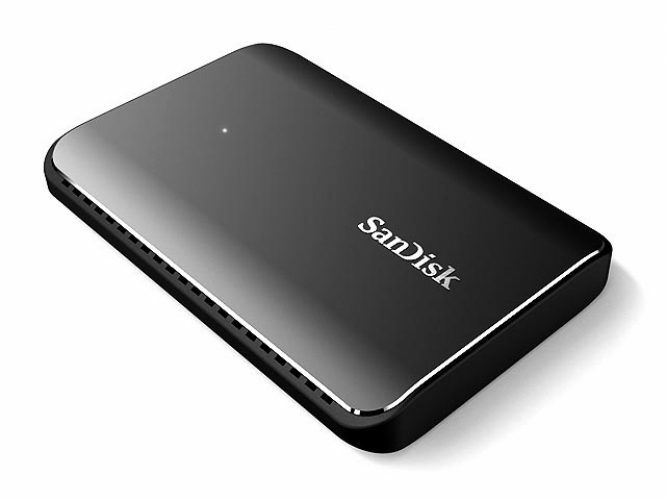 The SanDisk Extreme 500 sports a USB 3.0 port which will in no distant time be replaced by USB 3.1 port. Conclusion: The SanDisk Extreme 500 portable external SSD is not just any ordinary SSD. It stores and protects and transfers your data the Extremely Fast way. The MyDigitalSSD SuperSpeed USB 3.1 drive is not a very common SSD, the fact that it has been around for over a year notwithstanding. The design isn’t any bit different from what is obtainable in the market from other drives. The drive is wrapped around in a white colored casing which gives it a simple look. The MyDigitalSSD is laden with lots of features that make it worth noticing. First, just like the Samsung T3 Portable SSD, we reviewed earlier, it supports a SuperSpeed USB 3.1 port which is downward compatible with USB 3.0 and USB 2.0 and even USB 1.1. Additionally, the drive is equipped with the OTG V2 function that allows you share your documents to other devices while you’re on the go. The drive measures 3 x 1 x 0.3 inches and weighs just about 3.2 ounces. Transfer speeds on the drive aren’t close to the figures advertised, however, its transfer speeds are almost above par with drives like the Samsung T3 and Extreme 500. 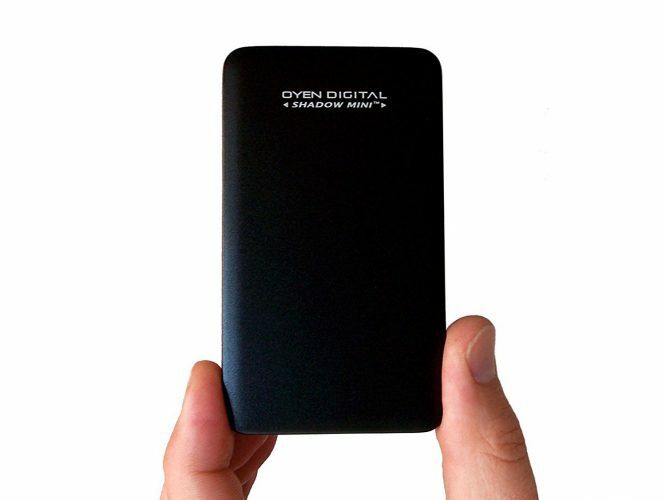 The MyDigitalSSD drive is fully compatible with both Windows and Mac computers and is bus powered via any of the two USB cables that ship with the drive. There’s one short USB 3.0 cable and a much longer USB 3.1 cable which facilitates easy transfer of your data. For the meantime, the drive is available in two common storage options: 256GB and 512GB. This MyDigitalSSD lacks an essential feature which is AES encryption. Conclusion: For the time being, one cannot help but appreciate the response a new drive like the MyDigitalSSD is getting in the SSD market today. If you care about storage but not features like encryption, then you should look its way. Have you ever been able to catch a Thunderbolt before? Certainly not. Not only is it impossible to do such, it is also inappropriate to even think of it. The LaCie Rugged Thunderbolt portable SSD is arguably one of the most sought after SSDs for Mac. The rugged drive is encased in an aluminum body and bordered by non-removable rubber bumpers on all sides. Permanently attached to the body of the drive is the Thunderbolt cable – this will surely save you the stress of looking for your Thunderbolt cables every now and then. 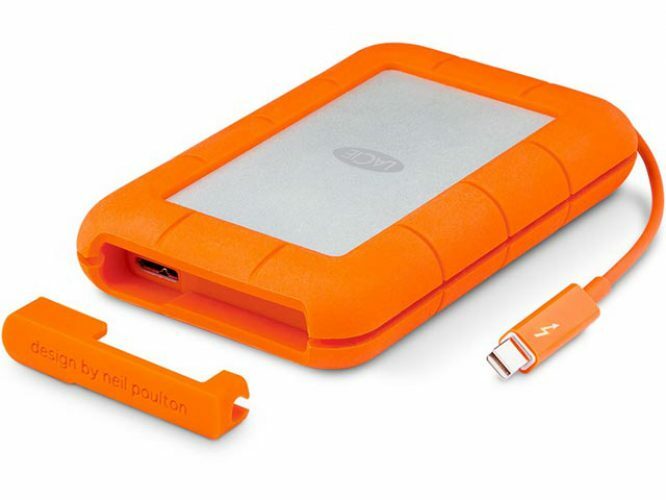 Additionally, the LaCie Rugged Thunderbolt SSD also supports USB 3.0 and ships a free cable with it; so if you’ve got a Windows computer, you can as well use the drive on it. Transfer speeds on the drive are blazing fast especially when you use the Thunderbolt ports on your Mac. The USB 3.0 port isn’t left out as it propels the movement of data to and from the drive at a relatively fast rate too. The drive measures 3.5 x 1.0 x 5.5 inches and weighs just about 3.5 ounces, a tad above aforementioned drives like the MyDigitalSSD portable drive. The ports are covered by a removable rubber seal which I feel should have had some sort of attachment to the body of the drive since it can get lost easily. According to LaCie, the drive is water and dust resistant. As a matter of fact, it can survive falls from heights of up to 2m as well as withstand weights of 1000kg. In other to safeguard your data, the LaCie Rugged Thunderbolt SSD supports the very high-level 256-bit AES encryption technology. It is also worth mentioning that the LaCie Rugged drive is compatible with Windows and Mac computers. Surprisingly, it can still be used on older Mac PCs with Firewire 800 ports as well as other computers with USB 2.0 ports. I cannot help but say I’m impressed with LaCie’s ingenuity. The drive is available in a handful of storage capacities: 250GB, 500GB, and 1TB – all of which can be paired with the Thunderbolt, USB 3.0, USB-C type or all of the above in one. LaCie gives you the freedom to control your drive using any of the software that comes with the drive. These include the LaCie Backup Assistant, LaCie Setup Assistant, and the LaCie Private-Public software. None save for the fact that it is a little bit pricey. Conclusion: There’s absolutely no reason why anyone who is in need of a rugged drive shouldn’t get the LaCie Rugged Thunderbolt Portable SSD. 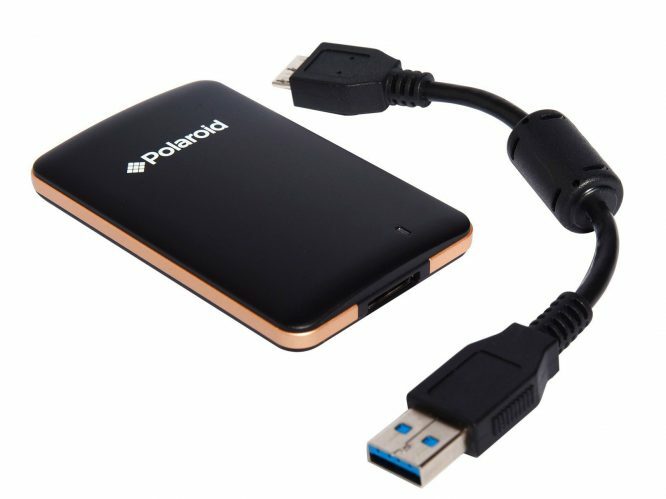 Just like the MyDigitalSSD which is a new entrant into the SSD market, so also is the Mini External SSD from Polaroid. The Mini External SSD is available in just two storage options: 120GB and 500GB. I’m pretty sure a lot of SSD users would go for drives with larger storage space. The drive measures about 1.95 x 3.14 x 0.37 inches and weighs about 3.2 ounces – this automatically gives it a spot amongst lightweight SSDs. For fast transfer of files to and from your devices, the Mini External SSD sports a USB 3.1 port which us surprisingly downward compatible with USB 3.0 and USB 2.0. 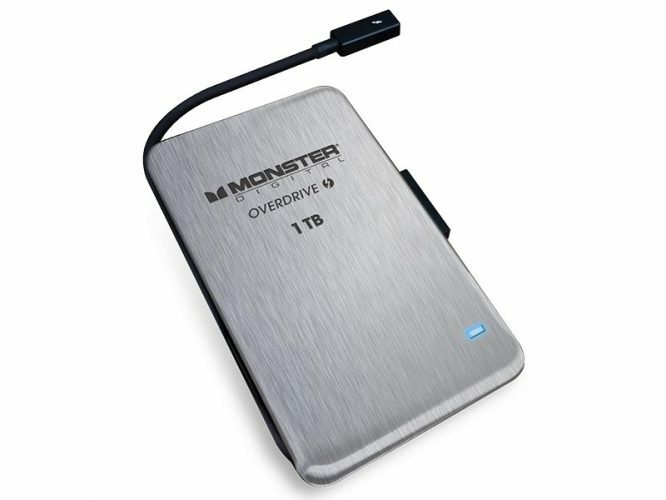 Additionally, the drive is also compatible with Android, Mac, and Windows computers, an added advantage over most SSDs which are only compatible with Mac and Windows only. The drive is nicely designed and feels somewhat strong and sturdy to touch. However, unlike the Samsung T3 Portable SSD, the Mini External SSD is not rugged. The two downsides of having the Mini External Portable SSD is that it has limited storage options and has no encryption ability. Conclusion: If you’d like to own a simple SSD without drilling a hole into your pocket, the Mini External SSD from Polaris would definitely suffice. At the mere mention of the name monster, one expects to see a huge looking ugly and irregularly shaped being or object. However, that’s not the case with the Monster Digital Overdrive Thunderbolt Portable SSD, a strong contender on our list of the best portable external SSDs. The Monster Digital Overdrive Thunderbolt Portable SSD is touted as the world’s fastest BUS powered Thunderbolt external drive. How true is that claim? We will find out in a bit. The drive’s design is simplistic with an aluminum casing that enables the drive to withstand as much as 1500g’s of force. The Thunderbolt cable is permanently fixed into a groove in the middle of the drive and this ensures that no cables are lost. The drive also features a small LED indicator which blinks whenever the drive is active. Beneath the groove where the Thunderbolt cable fits in is the air vent which helps keep the drive’s temperatures down when it’s in use. The Monster Digital Overdrive Thunderbolt Portable SSD is available in just three storage options: 240GB, 480GB, and 1TB. The drive measures 8 x 2 x 5 inches and weighs about 8 ounces. The data transfer speeds on the Monster Digital Overdrive Thunderbolt Portable SSD are on par with what is obtainable from other Thunderbolt enabled SSDs. Unfortunately, there’s no protection for your data since the drive lacks encryption features. The drive lacks the encryption features and as such leaves your data at the mercy of the elements. Conclusion: For fast data transfer without hassles, get connected to the Thunderbolt world with the Monster Digital Overdrive Thunderbolt Portable SSD. As small as it is, the Shadow Mini External Portable SSD doesn’t lurk in the shadows of big names like Samsung, SanDisk or LaCie. Designed to fly Oyen Digitals flag in the SSD market, the Shadow Mini Extreme is living up to expectations. The drive which measures about 4 x 2.3 x 0.4 inches and weighs about 7.2 ounces. It is available in four storage options; 128GB, 256GB, 512GB, and 1TB, thus providing ample storage space for anyone who cared to purchase it. The aluminum casing housing the drive is coated in black and silver colors, giving users the opportunity to choose the color that suits them. The Shadow Mini External Portable SSD supports USB 3.1 and is downward compatible with USB 3.0 and USB 2.0. Just beside the USB port is the small LED which comes alive when the drive is active. The SSD inside the drive is acclaimed to be the state of the art high-grade 3D NAND flash similar to the one which is found in the Samsung T3 Portable External Drive. The Shadow Mini External Portable SSD is compatible with both Mac and Windows PCs. Unfortunately, data on the drive cannot be protected because it lacks encryption capabilities. The Shadow Mini External Portable SSD lacks encryption support. Conclusion: Pocket-friendly although not lightweight, the Shadow Mini External Portable SSD might just be the right drive for you with its 1TB storage capacity. So if you’re looking for ample SSD storage for a much lesser price, you might want to look its way. The Lexar 512GB Portable SSD is undoubtedly fit to be classified as a first class SSD for Mac users who love a unique look for a much lesser price without compromising on performance. The design features a front panel that is adorned with up to six LED lights, five of which show the amount of storage space used whilst the remaining blue light serves as the LED indicator for drive activity. It is designed to fit into the Lexar Media hub. The Lexar 512GB Portable SSD which is available in only 256GB and 512GB storage options weighs 9 ounces and measures 4.8 x 2.2 x 3.6 inches. It cannot be said to be lightweight considering the fact that we’ve seen SSDs like the Samsung T3 which weighs only 1.8 ounces. The drive features USB 3.0, but sports a USB Type-B port which is very uncommon – most devices still rock the USB 3.1 and USB 3.0 Type-C model. However, Lexar ships the Lexar 512GB Portable SSD with a matching three feet cable so you don’t worry yourself about finding one. The USB port is compatible with USB 2.0. 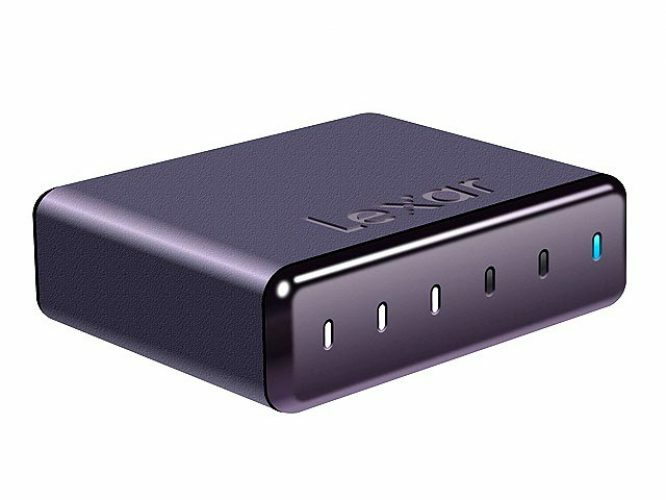 The Lexar 512GB Portable SSD is compatible with Windows and Mac computers. Additionally, the drive is also compatible with the Lexar Professional Workflow line of products. The Lexar 512GB Portable SSD lacks encryption and isn’t available in at least three different storage options. Conclusion: The Lexar 512GB Portable SSD is a good SSD for lovers of Lexar Products. If you also use the Lexar Professional Workflow line of products, it would come in handy. The ADATA SD700 Rugged SSD has won the hearts of many people who have already tasted and seen the sheer power of this magnificent drive. It’s one of the few SSDs in the market that has been able to get an IP68 rating. The design has a distinctive shape which I feel makes it look somewhat out of place in the league of drives like the Samsung T3 Portable SSD. That, however, doesn’t limit its ability to withstand being kept underwater at depths of 1.5m for up to 30 minutes. Aside from that, it is adequately covered from the dust that often wreaks havoc on our storage devices. The aluminum casing does a good job of shielding the drive. There’s a LED indicator that shows drive activity just beside the glaring SSD mark on the drive. The drive measures 0.55 x 3.3 x 3.3 inches and weighs just about 3.5 ounces. The ADATA SD700 is available in three different storage options; 256GB, 512GB, and 1TB. Out of the box, the ADATA SD700 works on Android, Mac, Linux, and Windows computers and comes equipped with the Acronis True Image HD and HDD to GO software, a Backup site, and an SSD toolbox. Unlike the Lexar 512GB portable SSD, the ADATA SD700 sports the state of the art 256-bit AES encryption but it has to be downloaded from the website. The drive is available in black and yellow & black colors. For fast transfer of data, one can easily make use of the USB 3.1 port on the drive which is a little below the advertised rates in terms of transfer speeds. The only major downside of the drive is the lack of USB-C port. Conclusion: There is absolutely no reason for you not to own this wonderfully alluring drive. 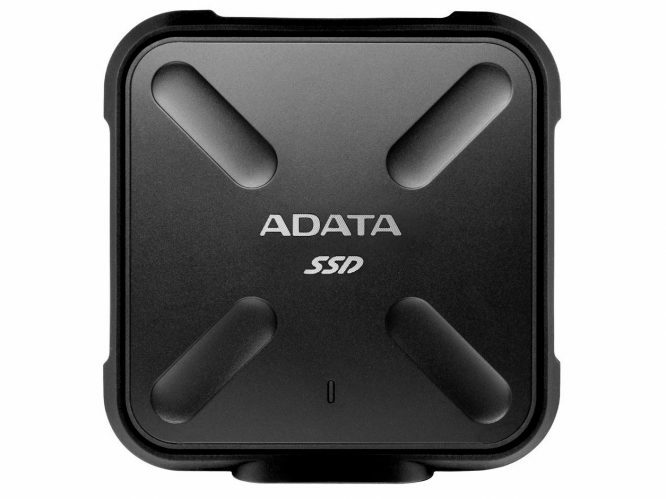 I tell you, it after the Samsung T3, the ADATA SD700 Rugged Portable External SSD is my second most sought after drive, and that’s because of aesthetic features only. The last but certainly not the least on our list of the best portable external SSD drives is the SanDisk Extreme 900 Portable SSD. With the Extreme 900, you can’t help but ask for more. The Extreme 900 has every right to brag about being the fastest SSD on the planet, however, it doesn’t. You will never know how powerful it is until you use it. The drive is available in three different storage capacities starting from 480GB, 960GB as well as 1.92 TB. That’s pretty ample storage space, you know. It measures 0.7 x 3.3 x 5.3 inches and weighs 7.4 ounces, a little bit heavier than the Shadow Mini™ External Portable SSD. 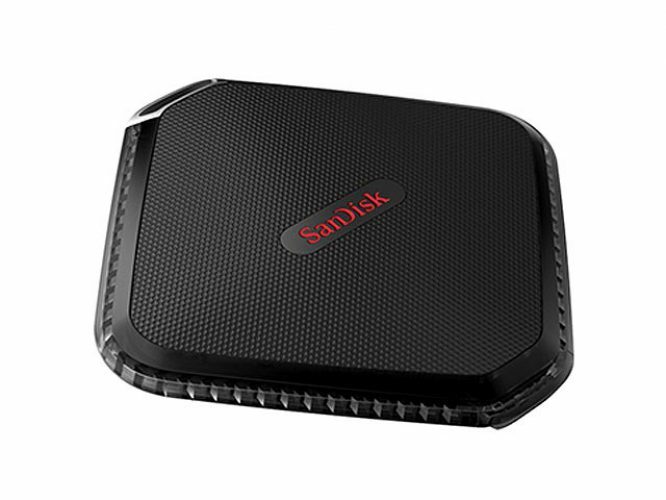 Unlike the Shadow Mini, the SanDisk Extreme 900 is capable of securing your data when you activate its 128-bit AES encryption feature via the SanDisk Secure Access software. For easy movement of your data to and from the device, there’s the USB 3.1 Type-C port which is downward compatible with the USB 3.0 and USB 2.0. To mitigate the stress of shopping for new cables, SanDisk generously included two different USB cables in the box. One of the cables is a complete USB-C cable at both ends and the other is a USB-C to USB-A cable. The data transfer speeds were not near as advertised, however, they’ll surely surprise you when you use it. The Extreme 900 is compatible with both Windows and Mac computers. Many claim the Extreme 900 is rugged. Well, as an SSD, it is fairly rugged based on the advantages it has over the conventional HDDs. Aside from that, the drive is housed in a tough rubberized enclosure which dampens the frequent tossing of the device. There has been a serious debate as to whether one should choose the Samsung T3 Portable SSD or the SanDisk Extreme 900 Portable SSD or its sibling, the SanDisk Extreme Portable 500 SSD. I can only say that this is a matter of preference of brand. The three drives are similar, and as such, there’s a close tie amongst the trio. It has no other flaw save for the fact that it is only available in one color. Conclusion: The SanDisk Extreme 900 Portable External SSD is for people who love premium SSDs with a touch of class and simplicity. It holds its grounds firmly and can easily tower over any new drive on the block. Finally, that brings us to the end of our review of the ten best portable external SSDs that are worth owning. Next, we will take a look at some of the important questions about SSDs and try to debunk as many myths as possible. 1. Which SSD brand is most reliable? Truth be told, one cannot exactly pinpoint an SSD and say yes, this is the king of SSDs. This is because most SSDs have similar specifications just like their counterparts. 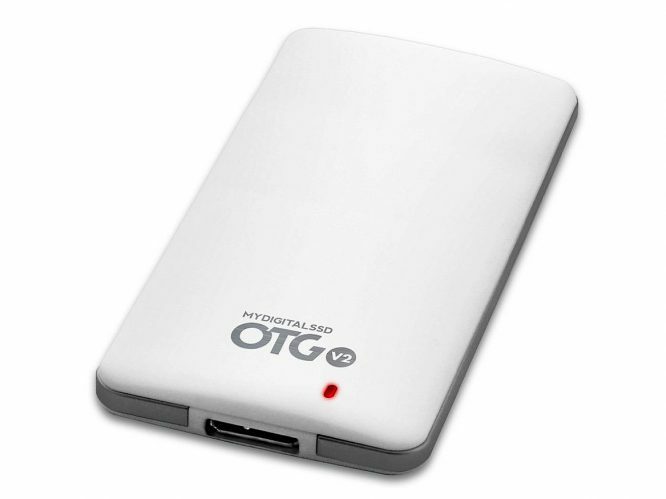 However, based on personal preferences, the Samsung Portable T3 SSD is one of the leaders in this segment. It’s sleekly designed, very small and has enough storage space to handle your storage needs. 2. Which SSD has the best warranty? Most SSDs have a warranty of two years or three years. It is important to avoid buying SSDs with a warranty period of one year except you intend to use it for a short while before dumping it. 3. Which SSD will fit my laptop? The word fit is ambiguous here. It could mean fit with respect to storing all the data on your laptop or fit with respect to matching the color of your laptop. Whichever the case may be, it boils down to personal preferences of color and storage capacity. If your laptop has a 512GB internal HDD or SSD, getting a 1TB SSD would be a better idea. 4. Which SSD fits the MacBook Pro? MacBook PCs perform better when they are paired with SSDs that have Thunderbolt Ports. The Thunderbolt port is faster than the conventional USB 3.1 port. There is also a handful of SSDs with the capability of transferring data through Thunderbolt 2 ports which are more powerful than the Thunderbolt port. It is imperative to know the specifications of your laptop with regards to its ports and then the specifications of the SSD you are buying with regards to its ports too. Additionally, there is also the need for you to also check the general product specification to know if the drive needs to be formatted before use on MacBook. 5. Which SSD should I buy for my desktop? What do you need the desktop SSD for? Large storage or simple backup of your files? It boils down to the need. If storage is the main reason, then you should go for desktop SSDs with huge storage drives. More so, you can get SSDs with configurable RAID options for better results although it is important to also point out that any SSD that worked on a laptop would definitely work on a desktop. 6. 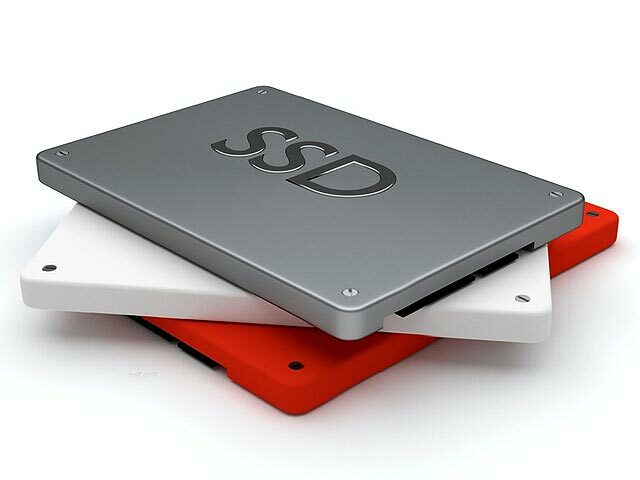 Why choose SSD over HDD? a. Speed: One of the major advantages that SSDs have over the HDDs is the transfer speeds of data. SSDs store and retrieve data using a mechanism which is different from that of HDDs. This enables SSDs to retrieve and store data 10 times faster than HDDS, thus giving them a strong edge. b. SSDS don’t fragment: When an HDD starts getting old, it starts fragmenting large files stored on it. This is not the case with the SSDs which don’t fragment the data no matter how old they become. c. SSDs have nonmovable parts: The SSDs are built in such a way that they have no movable internal parts, unlike the HDDs which do. This reduces the risk of losing data on the SSD in the event of a physical drop. d. SSDs are silent: No matter how soundproof an HDD is, it cannot compare to an SSD which makes no noise at all when they are both in use. e. Power: SSDs do not draw much power from the computers since they need no energy to activate any moving parts. This places them far ahead of HDDS when it comes to storage. The only thing HDDs have on SSDs is that HDDs are readily available and are much more affordable than the SSDs. 7. Is an SSD essential for a programming laptop? This is an important question. For just any programmer, an HDD will do. But any programmer who prefers speed surely needs to look the way of SSDs. You will get faster booting times, faster project load times, and faster debug times to mention a few benefits. For a longer lasting SSD, the following are some important maintenance tips you should have at the back of your mind. If you are always on the move and you are often going to different places with different temperatures, rough terrain, on water etc, you should get yourself a rugged SSD. Rugged SSDs are specifically built to store your data while you are on the go to various locations with varying physical conditions. Buy SSDs with at least two to three years warranty. The longer the warranty, the better for you. Don’t toss your SSDs through the air to your friend. If either of you is so busy that none of you can get up to collect it or give it to the other, then allow the SSD sit on the table. A slight fall can lead to a series of problems on an SSD especially if it’s not rugged. Keep your SSDs out of moisture filled environments, the fact that they are water resistant notwithstanding. In conclusion, the best things in life do not come easy. For the best portable external SSDs, get ready to spend some extra bucks. You’ll be glad you did. I am after an external hard drive but I’m not 100% sure which to go for. I am looking for the ability to process data fast, this is my #1 priority. Up to 500GB is adequate for the data I will need for storing. I had a look at the Sandisk Extreme 900 SSD and although it’s more expensive than the alternatives processing data fast is my priority. Which other hard drive here is comparable or better or would you say this is the better option for speed? – or external portable ssd. Other options will cost much higher.